This Seiko dive watch is quite possibly the ideal diving watch. Big grooves on the unidirectional rotating bezel make it easy to set. The screw-in crown is nice and big with grooves that make it easy to set the time. The hands and markers are large, easy to read, and luminous. 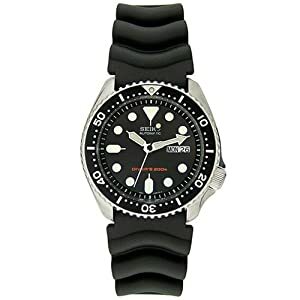 The black rubber watch band is comfortable on land or in the water. The water resistance rating is 200 meters (660 feet), which you would expect for a dive watch. The crown is in the 4 position for added comfort. If you've been looking for an excellent underwater watch at a good price, you've found it.